You remember Brabus, right? It’s the high-performance Mercedes tuner that recently created this, uh, custom Smart limousine. But that’s the great thing about Brabus: It’s also created hotted-up Smarts in the past and the Brabus 125R is the newest, hottest version yet. 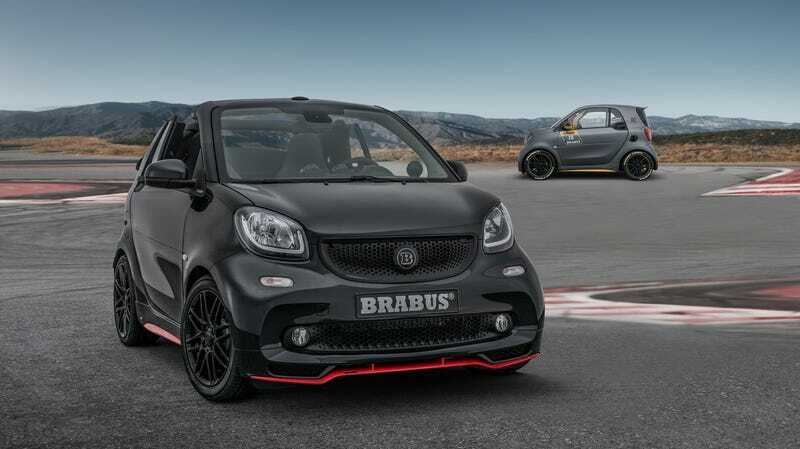 With a limited run of only 125 examples, the Brabus 125R took a current Smart ForTwo and squeezed out 125 horsepower and 148 lb-ft of torque from the rear-mounted, turbocharged three-cylinder engine with a modified intake, intercooler and recalibrated the engine control unit. It also has a stainless steel sport exhaust system with actively controlled flaps and three tailpipes. This is up from the stock ForTwo’s 89 HP and 100 lb-ft of torque. It might not sound like a lot of power, but in something as small as the ForTwo, I’m betting that it feels significant. The zero to 62 mph time is now 9.2 seconds and top speed is electronically limited to 109 mph. But drag racing and top speed runs aren’t the point of a Smart. You’re driving a Smart if you love darting around in a tiny car and now it finally has some extra pickup. To cope with the extra power, Brabus also gave the 125R high-performance tires and a lowered suspension. It also gave the car a front spoiler, rocker panels and carbon covered side mirrors. I didn’t much enjoy driving the normal Smart, but this lowered and more powerful one has piqued my interest. Unfortunately, as only electrified Smarts are offered in the U.S., I’m not sure if the Brabus 125R is destined for our shores. I’ve emailed Brabus for clarification and will update if I hear back. In Europe, the 125R comes to €39,900, which is roughly $46,000—a very high price for a Smart! Still, though, you could have this Brabusified Smart... or you could have a boring Porsche 911. They’re basically the same car.